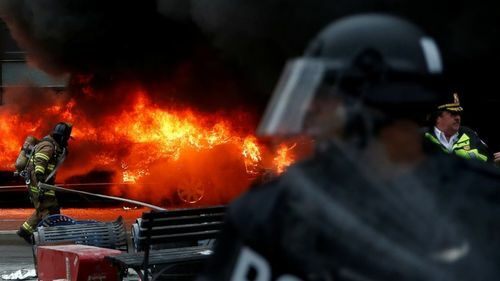 PHOTO: Police and firefighters stand near a limousine which was set ablaze during a protest against President Donald Trump on the sidelines of the inauguration in Washington, Jan. 20, 2017. 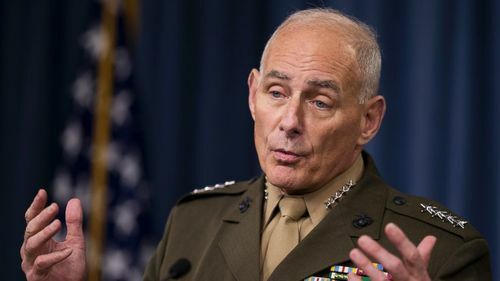 JUST IN: Senate confirms Gen. John Kelly as Secretary of Department of Homeland Security, 88-11. 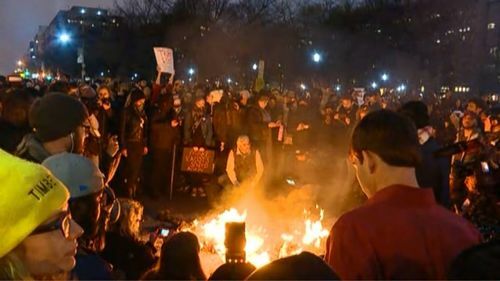 ABC News' Charli James reports from Washington, D.C. where protesters are gathering during inaugural parade. 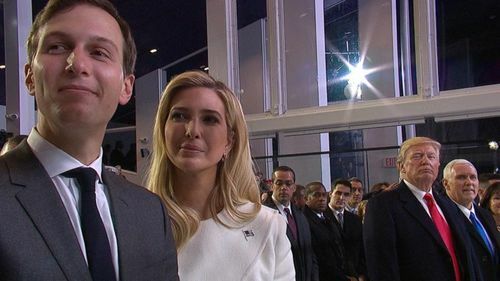 ABC News' Political Director Rick Klein explains the presidential exemption to conflict of interest laws and how they may still affect the Trump family. 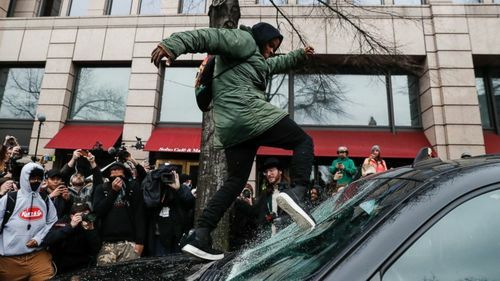 PHOTO: A protester kicks in a windshield during a demonstration in Washington, Jan. 20, 2017, after the inauguration of President Donald Trump. 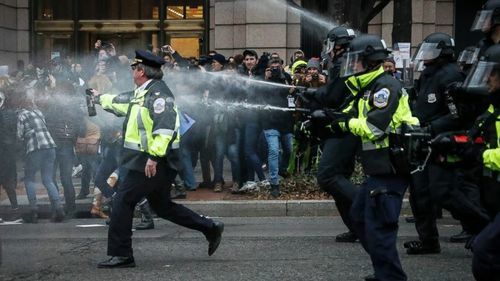 PHOTO: Police fire pepper spray on protesters during a demonstration after the inauguration of President Donald Trump, Jan. 20, 2017, in Washington. 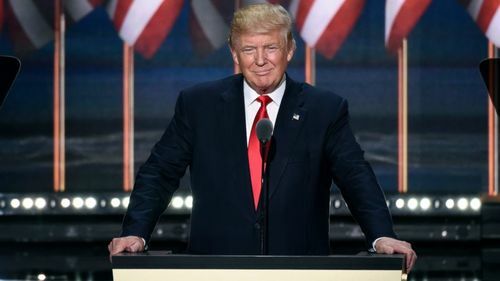 Throughout the long presidential campaign and after the election, Donald Trump made many promises to the American people. 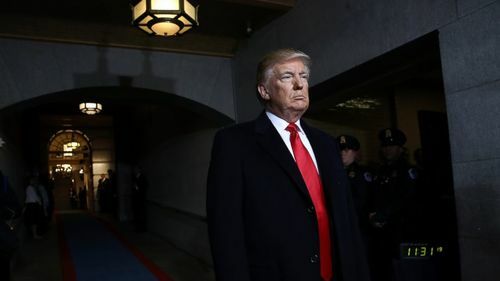 Now ABC News is looking at some of the promises that he made to the American people before his inauguration and how those statements have changed since he declared his candidacy. We plan to follow his progress on 13 of his best-known and widest-reaching promises as he occupies the Oval Office. JUST IN: Vice Pres. 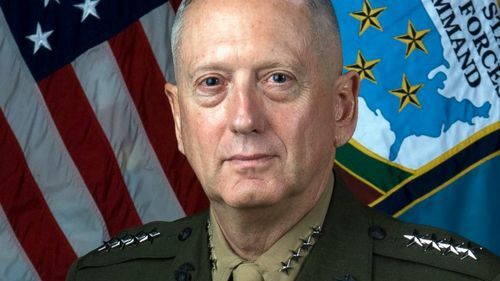 Mike Pence swears in retired Gen. James Mattis as Secretary of Defense. 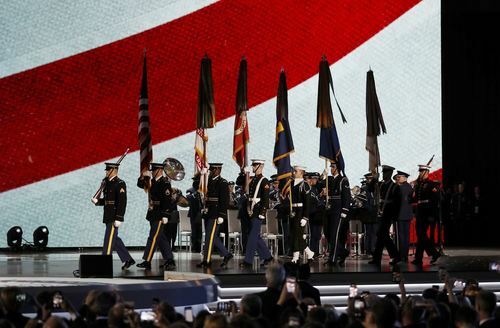 Minutes after President Donald J. Trump was sworn into office, the Trump Administration detailed its commitment to an "America First" foreign policy and rebuilding the U.S. military. 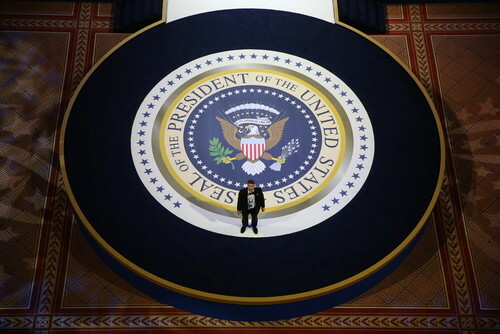 PHOTO: Preparations for the Salute to Our Armed Services Ball, which President Donald Trump is scheduled to attend on the night of his inauguration in Washington, Jan. 20, 2017. 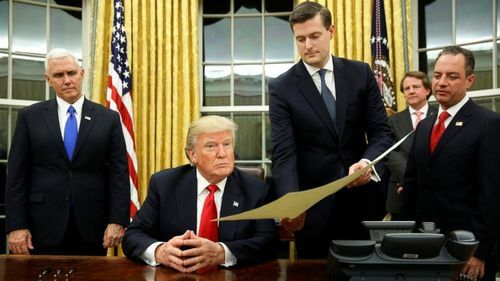 PHOTO: White House Staff Secretary Rob Porter gives President Donald Trump the document confirming James Mattis as Secretary of Defense, his first signing in the Oval Office in Washington, Jan. 20, 2017. 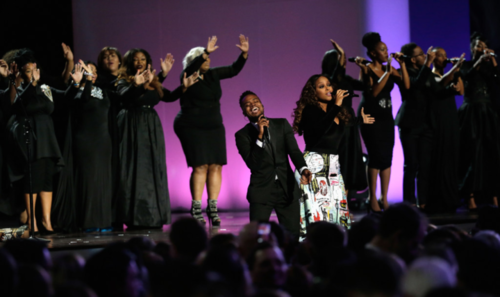 PHOTO: A military color guard marches into the "Liberty" Inaugural Ball prior to the arrival of U.S. President Donald Trump and his wife, first lady Melania Trump, in Washington, U.S., January 20, 2017. Sitting at the Resolute Desk in the Oval Office for the first time, President Donald Trump signed an executive order "minimizing the economic burden" of Obamacare, and signed commissions for Secretary of Defense James Mattis and Secretary for Homeland Security John Kelly. Standing at Trump's side was Vice President Mike Pence, senior adviser Jared Kushner, and Chief of Staff Reince Priebus. Priebus laid out the executive order on Trump's desk stating it is "minimizing the economic burden of the Patient Protection and Affordable Care Act pending repeal." 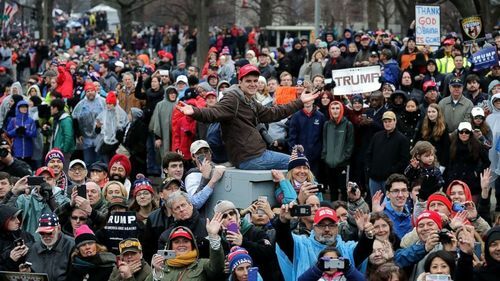 PHOTO: Supporters and detractors of U.S. President Donald J. Trump line the Inaugural Parade between the U.S. Capitol and the White House, Jan. 20, 2017, in Washington. 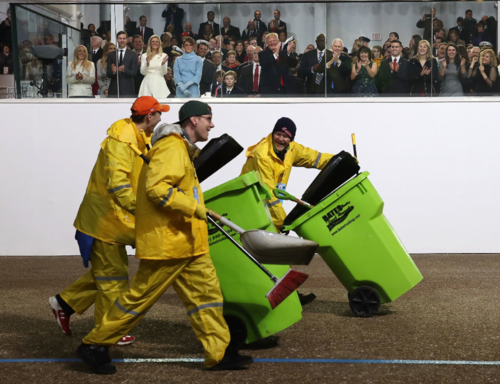 PHOTO: President Donald Trump watches as three men follow a horse detail to pick up any fallen debris, during inaugural parade in front of the White House on January 20, 2017 in Washington, DC.